The death of August H. Genetti Monday night marked the end of a truly remarkable career. A saga which personifies the American dream – the story of an immigrant boy who became a giant in not one, but several fields of endeavor. The one factor which spelled success for Gus Genetti was that everything he did had to be “top drawer.” He was a perfectionist all the way. Gus Genetti achieved fame as a food merchant, a mink rancher, a farmer and at a time when an ordinary man would have gone into retirement became a hotel and restaurant owner who earned national distinction. He learned the food business working for his father in a meat and grocery business which had its beginning in a door-to-door wagon. 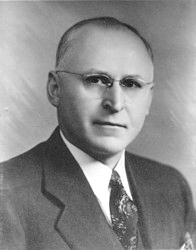 Returning to the family business after serving in the Army during World War I he became president and general manager of D. Genetti and Sons. Under his leadership the firm grew from one store to a chain of 18 neighborhood markets. Then came the birth of the supermarket and Genetti’s was ready to meet the new challenge, building at Broad and Laurel streets a market which at the time was unique in its field. Supplying the chain with many of its needs was a model farm which Gus Genetti retained, when in 1940 he sold his interests in the food chain to his brothers. Breeding of mink soon went beyond the hobby stage and soon Gus Genetti was developing mutations which won him national honors. But the life of a country gentleman was too tame for a man of such drive and stamina and at the age of 60 he purchased a barbecue restaurant and grove on Route 309 north of the city and here built a hotel and restaurant which was to become a landmark of the east. Again moving into the mainstream of a new concept he added motel units and later a ballroom which was to become the focal point of the area’s most important social affairs. Even upon approaching his 80th birthday he was ready to move onward and had plans for a new and modern hotel at the site, going so far as to raze the original structure in preparation for a great expansion. But finally failing health forced him to yield the reins to his son William who presently heads the firm. Men like Gus Genetti do not come along often but they serve as inspirations to those who believe that the American dream will never die.